Baha Mar is a very large resort complex made up of 3 hotels, a casino, 7+ pools, a giant gym and spa, and over 30 restaurants and bars. 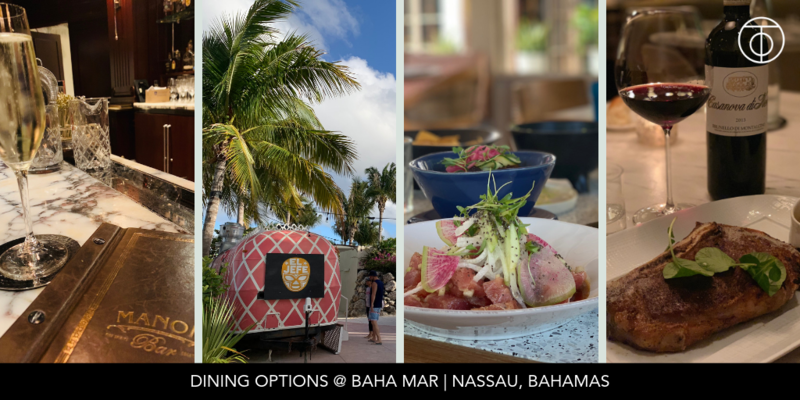 Needless to say, experiencing the Baha Mar resort is a lot to digest and, as we learned our way around, it quickly became clear that the dining at Baha Mar was going to be a top highlight of our stay. 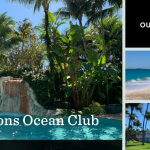 As one hotel seamlessly flows into the other, it isn’t immediately clear which restaurants and bars belong to which resort and that is fine because guests at any of the 3 hotels have signing privileges at all resort outlets. One thing, you should know is that most restaurants will require advance reservations for dinner, so make a plan before you arrive! You can see a complete list of dining options on the Baha Mar website or on the individual hotel websites. Regatta Buffet – Buffets can be hit or miss, but Regatta runs a smooth operation with many options to keep everyone in the family happy. We were fans of the omelette station, the build-your-own quesadilla options, and the fresh fruit smoothies. We declined the splurge, but we heard the crepes were a crowd favorite! Regatta is a perfect breakfast option if you’re traveling with your family or a group. Ourisman Travel clients staying at the Grand Hyatt will have the Regatta Buffet included daily with their reservation (for 2 adults per room). Commonwealth – Ourisman Travel clients staying at the Rosewood will receive complimentary breakfast at Commonwealth. This classic breakfast buffet is smaller and more curated than Regatta, but the ambiance is quieter and more up-scale. Cafe Madeleine – If all you want is a good cup of coffee and a pastry or quick breakfast (quiche, croissants, etc), then this French inspired cafe is the perfect spot. they offer indoor/outdoor cafe seating or grab-an-go options. Starbucks – don’t worry, the old standby has a location at Baha Mar! 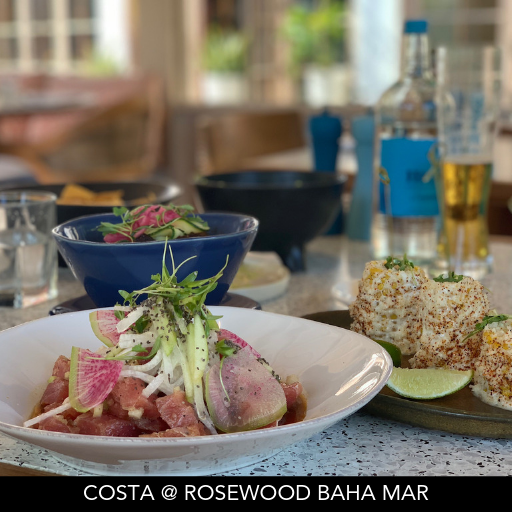 COSTA – Dining at COSTA for lunch (twice) was hands down one of our best meals during our stay at Baha Mar. This restaurant is nestled in the Rosewood courtyard garden so it might be hard to find if you aren’t staying at Rosewood, but it is worth the hunt! The menu features latin flavors and the restaurant as an island oasis setting, the dining “cabanas” look like they are floating over a giant koi pond. Mexican cuisine in the Bahamas seems like an odd choice, but the chef comes from Rosewood Mayakoba and the food is incredible, so it works! Fresh tuna and red snapper ceviche, paired with great guacamole, Mexican street corn and mushroom ‘al ajillo’ provided the perfect blend of nutrition and flavor. While sipping our Grand Marnier margarita’s, we were even treated to a parade of baby flamingos! Fi’lia – Carpaccio, Caprese, and Calamari! This italian eatery has all you need for a relaxing al fresco lunch. We recommend the local conch arancini and truffle pizza. Add in a glass or two of rosé and your lunch is complete! 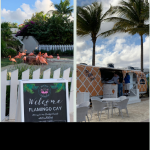 One of the fun features of Baha Mar is all of the food trucks and street food style “shacks” dotted around the resort. So, while you’re relaxing out by the pool, you don’t have to throw your cover-up on and head to a restaurant for lunch, you can just wander over to a food truck for tacos, burgers, hot dogs, etc. Our favorite was Da’ Poke Bowl Shack for giant bowls with rice, crisp veggies, and delicious marinated tuna. Carna – The restaurant was recommended to us by the GMs of both the SLS and the Grand Hyatt and it was backed up by every staff member with spoke to. So, with high expectation, we saved our reservation at Carna for our final dinner at Baha Mar. We wanted to round out our site inspection trip with a proper steak and full-bodied red wine. Located in the hub of the casino, Carna’s vibe is warm and modern. Clear display cases of different cuts of meat provide a rustic butcher feel followed by plush seating and excellent service. We decided to go a classic route; Wagyu beef, brussels sprouts with a surprising soy kick and mashed potatoes that had more butter than potatoes. But a little decadence is what vacation is all about. Pairing the meal with a bottle of Brunello was the perfect way to round out all the flavors Carna provided. Cleo Mediterraneo – Who doesn’t love tapas?! Cleo is located in the SLS lobby and word quickly got out that it is a top favorite at the resort. The meze platters, kebabs, and pita bread and dipping sauces kept our group happy and well fed! The crowd favorite dishes were the brussels sprouts, haloumi cheese, and spicy cigars. Commonwealth– Located on the lowest level of the Rosewood, this brasserie offers a variety of dishes that take you around the world; each dish is inspired by a different country in the British Commonwealth. Try the honey glazed prawns, tuna & green apple tartare, and burrata to start, followed by flavorful pork shoulder, grilled Canadian lobster with mustard and cognac, or local grouper fish and chips. The classic beef Wellington is one of their top choices as well. If you’re feeling adventurous for dessert try the Sky Juice ice cream, which is a take on a traditional Bahamian beverage of coconut water, condensed milk, spices and gin. Other good dinner options are Shuang Ba (we regret we didn’t get a chance to try this as it comes highly recommended), 3 tides for good seafood, and Katsuya for sushi. 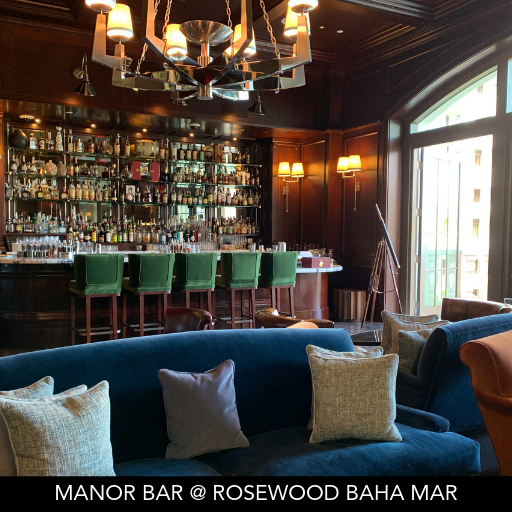 Manor Bar – if you’re feeling moody and want a dramatic atmosphere with classic old-world cocktails and a large rum list, this is where you want to start your evening. The decor in this room has a feel of a gentlemen’s club with deep velvet sofas, leather arm chairs, jewel tones, and dramatic lighting. The menu is inventive and the servers are friendly and chatty. The room is small so it fills up fast and service was sometimes slow, so give yourself plenty of time if you’re on the clock for a dinner reservation. Monkey Bar – if you go to Manor Bar when you’re feeling moody, then go to Monkey Bar when you’re feeling fun and social. This is the lobby bar at the SLS and it is definitely the best casual hang out space in the entire resort. The drinks are simple and the people-watching is fantastic! The large lobby is divided into small conversation areas so the buzzy atmosphere never gets too crazy and you can still comfortably hold a conversation. SkyBar – Want more energy than the lounge bars but not quite ready for the nightclubs? The rooftop bar at the SLS is the perfect in-between option. It still has a “see and be seen” vibe, but it is still pretty laid back and the views overlooking the resort are worth seeing! Note: during slower times, SkyBar is only open on weekends. We weren’t sure what to expect from Baha Mar, but we were pleasantly pleased with all of the dining options! We did have some complaints about slow service, which isn’t surprising in a young resort like this. Otherwise, our meals were all good quality with fresh ingredients and there is enough variety so you can have something different each day, even over a week-long vacation. This entry was posted in Caribbean, Food and tagged Baha Mar, Bahamas, Beach vacation, Caribbean, food, Hyatt, restaurants, Rosewood. Bookmark the permalink.